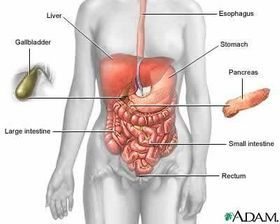 Pancreatic cancer is a malignantneoplasm originating from transformed cells arising in tissues forming the pancreas. The most common type of pancreatic cancer, accounting for 95% of these tumours, is adenocarcinoma (tumors exhibiting glandular architecture on light microscopy) arising within the exocrine component of the pancreas. Did Hemp Oil cure man's stage 4 pancreatic cancer? Undated - Article ~ Pancreatitis & Medical Marijuana. 2013 - Study ~ Cannabinoids inhibit energetic metabolism and induce AMPK-dependent autophagy in pancreatic cancer cells. 2013 - Study ~ Comparative proteomic and phosphoproteomic profiling of pancreatic adenocarcinoma cells treated with CB1 or CB2 agonists. 2013 - Study ~ (R,R')-4'-Methoxy-1-naphthylfenoterol Targets GPR55-mediated Ligand Internalization and Impairs Cancer Cell Motility. 2011 - Study ~ Gemcitabine/cannabinoid combination triggers autophagy in pancreatic cancer cells through a ROS-mediated mechanism. 2009 - Study ~ TRB3 links ER stress to autophagy in cannabinoid anti-tumoral action. 2008 - Study ~ Emerging role of cannabinoids in gastrointestinal and liver diseases: basic and clinical aspects. 2008 - Study ~ Cannabinoids in pancreatic cancer: Correlation with survival and pain. 2006 - Study - Cannabinoids Induce Apoptosis of Pancreatic Tumor Cells via Endoplasmic Reticulum Stress–Related Genes. 2006 - Study ~ Cannabinoid derivatives induce cell death in pancreatic MIA PaCa-2 cells via a receptor-independent mechanism. 2006 - News ~ Cannabinoids Halt Pancreatic Cancer, Breast Cancer Growth, Studies Say. Address all correspondence and requests for reprints to: Dr. Vincenzo Di Marzo, Istituto per la Chimica di Molecole di Interesse Biologico, Consiglio Nazionale delle Ricerche, 80072 Arco Felice (NA), Italy. E-mail: vdm@trinc.icmib.na.cnr.it. Anandamide and 2-arachidonoylglycerol (2-AG), two endogenous ligands of the CB1 and CB2 cannabinoid receptor subtypes, inhibit the proliferation of PRL-responsive human breast cancer cells (HBCCs) through down-regulation of the long form of the PRL receptor (PRLr). Here we report that 1) anandamide and 2-AG inhibit the nerve growth factor (NGF)-induced proliferation of HBCCs through suppression of the levels of NGF Trk receptors; 2) inhibition of PRLr levels results in inhibition of the proliferation of other PRL-responsive cells, the prostate cancer DU-145 cell line; and 3) CB1-like cannabinoid receptors are expressed in HBCCs and DU-145 cells and mediate the inhibition of cell proliferation and Trk/PRLr expression. ß-NGF-induced HBCC proliferation was potently inhibited (IC50 = 50–600 nM) by the synthetic cannabinoid HU-210, 2-AG, anandamide, and its metabolically stable analogs, but not by the anandamide congener, palmitoylethanolamide, or the selective agonist of CB2 cannabinoid receptors, BML-190. The effect of anandamide was blocked by the CB1 receptor antagonist, SR141716A, but not by the CB2 receptor antagonist, SR144528. Anandamide and HU-210 exerted a strong inhibition of the levels of NGF Trk receptors as detected by Western immunoblotting; this effect was reversed by SR141716A. When induced by exogenous PRL, the proliferation of prostate DU-145 cells was potently inhibited (IC50 = 100–300 nM) by anandamide, 2-AG, and HU-210. Anandamide also down-regulated the levels of PRLr in DU-145 cells. SR141716A attenuated these two effects of anandamide. HBCCs and DU-145 cells were shown to contain 1) transcripts for CB1 and, to a lesser extent, CB2 cannabinoid receptors, 2) specific binding sites for [3H]SR141716A that could be displaced by anandamide, and 3) a CB1 receptor-immunoreactive protein. These findings suggest that endogenous cannabinoids and CB1 receptor agonists are potential negative effectors of PRL- and NGF-induced biological responses, at least in some cancer cells.